Sunderland Pianoforte Society continued their 74th season with a concert which was given by pupils of David Murray and local piano teacher, Eileen Bown. 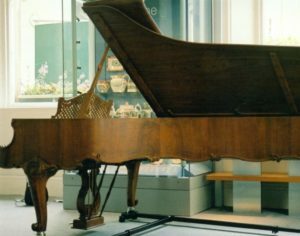 The concert was given in the Pottery Room at Sunderland Museum and was well attended by members and proud parents as well as families who enjoyed an evening of superb music given by pianists of varying ages ranging from Flint Shepherd who is 6 years old to mature performers. The aim of the Society is to encourage the study of piano playing and this was certainly done on Tuesday evening with the help of David Murray who introduced the pianists. The evening began with 6 year old Flint Shepherd who played a Prelude by Hummel, and this was followed by Ciaran Leahy playing “Staccato Beans” by Tan Dun. This was followed by James Barker playing “Somewhere over the Rainbow” and then Louis Scott played “Cruella de Vil”. These four young pianists not only played well but are to be congratulated on their stage presence and appearance. We then heard Icy Wong playing Chopin’s Nocturne in D flat op.27 no.2 with great sensitivity to be followed by William Horseman playing Rachmaninov Prelude in B minor op.32 no.10. Amy Baker then played the first movement of Sonata in D minor op.31 no.2 by Beethoven and the first half of the evening ended with Tom Yang playing 3 movements from the Children’s Corner Suite by Debussy. After the interval during which mince pies and wine were enjoyed Nicole Lau played the Prelude and Fugue in G major by Bach and was followed by Victoria Robinson who played Debussy: Pagodes from Estampes and Saint Saens Etude en forme de Valse, played with great polish and style. Amy Baker made a welcome return to play Cadiz by Albeniz and was followed by a lively performance of Toccatina by Kapustin given by Alan Coxon. The concert ended with a performance of the famous Rhapsody in C by Dohnanyi given by William Horseman. It is encouraging to hear these talented young pianists, some of whom will be going on to have professional careers and the Society wishes them every success. Many thanks go to David Murray and Eileen Bown for all their hard work in producing such a good evening. This entry was posted in Recitals, Reviews on 15/12/2016 by David.